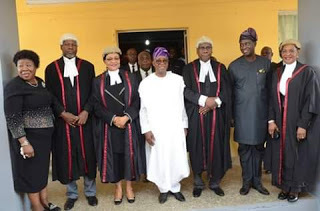 The governor said: "I cannot end this address without lending my voice to the request of the stakeholders that you should graciously consider the possibility of having a Court of Appeal (division) sited in Osun state. "‎I want assure you my Lords that our government would do everything possible to support this move"
"In this 20-year-old challenging democratic journey, the Judiciary has filled in the gap by providing the barometer for reaching the desired destination. "At every turn, the Judiciary has lived up to its billing as the last hope of the common man. Indeed, the nation owes the gradual sanitization and stability of our democracy to the Judiciary. "Your Lordships, your current assignment in Osun State is in furtherance of the Judiciary’s role as the arbiter and protector of the rule of law. "The Judiciary has played this role with vigour and unblemished integrity. It has demonstrated to the people that it remains the filtering agent when unscrupulous elements muddle up our judicial waters. "The Court of Appeal has established a reputation for itself as the home of landmark judgments in the nation. "In furtherance of your resolve to build sustainable democracy and a just and peaceful nation, I urge Your Lordships to continue to uphold the tenets that have endeared you to the people as an institution of nobility, integrity and trust", Oyetola said. a workload sufficient enough for that Court to worry about for the next 6 months, if not more. ‎"Permit me to say that if justice is not to be delayed and thus, denied, an immediate solution, such as the establishment of a Division of the Court of Appeal in Osogbo, Osun state ought to be proffered", she stated. She added: "Since the period that I have been the head of the Court of Appeal sitting in Akure, I have noticed that Osun has a huge number of appeals in this Division. "But commendably, litigants and their counsels flock the Court in Akure on daily basis, sitting sometimes for hours to ensure the hearing and disposal of their matters.